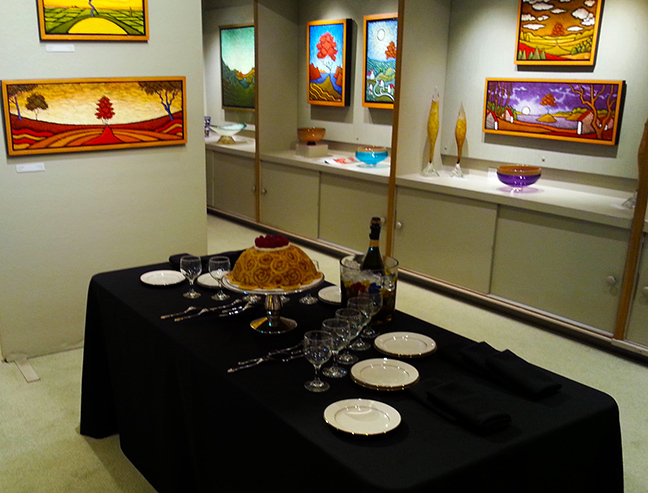 I was the guest speaker last night at a private event held at the West End Gallery. It was a combination dessert /wine tasting with a bit of a gallery talk thrown in to break up the great flavors, all of which was an item offered in a charity auction to benefit the Children’s Center of Corning that was held earlier in the year. The generous winning bidders, Chris and Darryl Heckle, and a group of their friends were treated to four incredible desserts and their appropriate wine accompaniments provided by Susan Barbosa, the executive chef at Corning Inc.
Oh, best of all– I got in on the goodies as well. The one shown above was the first of the night, an exquisite Charlotte Royal. 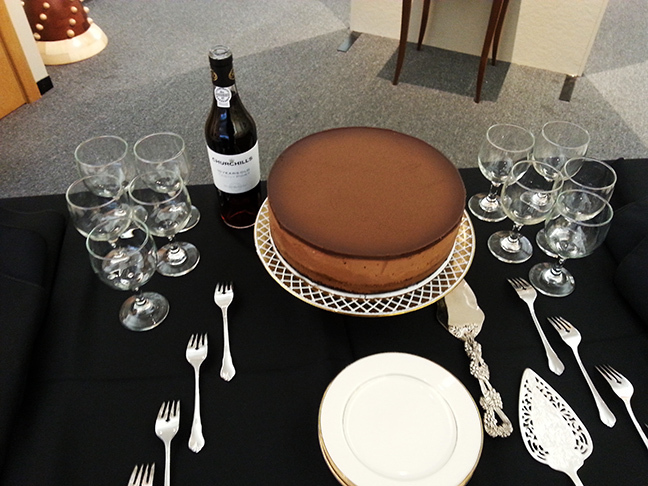 It was a beautifully crafted dome of two cool and creamy mousses under a covering of thin sponge cake slices. Wonderful flavors. My favorite was the finale offering was this monster, a base of chocolate cheesecake filled with profiteroles (creme puffs!) that was topped with a deep chocolate ganache. Long story made short– I cleaned every drop of it off my plate. I could have eaten that until my eyes popped but decorum dictated that I just eat the large piece I was given. I don’t know how decorum judged me licking my plate clean but that’s the risk you take when you let a guy like me into an event like this. All kidding aside, it was a lovely evening with a very congenial and interesting group of people. I gave an abbreviated version of my gallery talk and answered a number of questions from the group. I also talked a bit about a few other artists in the gallery, pointing out the influence of the late Tom Buechner on the many artists of this area. Hopefully, they found something of interest in much of this. A hearty “Thank You” to the Chris and Darryl Heckle for their generous bid. Also, many thanks to Peigi Cook of the Children’s Center for her coordination of the auction and this event and to Susan Barbosa for the meticulous preparation and service of her wonderful goodies. And to Jesse and Linda at the West End Gallery for opening their gallery to this event. It was a pleasure. And tasty, too!